â˜›PROTECT YOUR RESPIRATORY SYSTEM. Unigear mask can protect you from dust, pollen, allergens, smoke, vehicle exhaust, PM2.5, and haze day. Coming with active carbon filters, our mask isolates 98% of gas, chemicals, fumes and the particle pollution. It is suitable for cycling, running, biking, hiking, woodworking and winter sports. â˜›SUIT FOR MOST PEOPLE: Made of elastic material, the size can be adjusted to meet the most head type (up to 27.9 inches). With a fixed aluminum sheet on the bridge of the nose, Unigear masks can fit different sizes of face well to prevent sliding. â˜›REUSABLE AND WASHABLE: The package includes activated carbon masks, two valves and filter cotton which need to be replaced after 30 hours used. The mask is easy to wash and clean when they get dirty. â˜›LIFETIME WARRANTY AND MONEY BACK GUARANTEE: Unigear is dedicated to address any product issues and committed to delivering an excellent experience for all buyers. If for any reasons you are not satisfied with our mask, email us for any questions, we have provide lifetime warranty. Are you now troubled by dust chemicals, smoke and particles? Each mask comes with two extra valves and one filter cotton. It will be more convenient to replace the filters regularly. Unigear mask can be used for anti-dust, anti-vehicle exhaust, anti-pollen allergy, anti PM2.5 and haze day protection. Suitable for cycling, running, biking, hiking, skiing and woodworking and other activities. Unigear strives to manufacture the products with high quality for our customers. 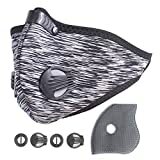 Package includes a Activated Carbon Dustproof Mask with two extra two valves and one filter cotton.